Abstract: At 170 x 170mm in size, the Albatron KI51PV-754 is quite a bit smaller than a regular desktop or even Micro-ATX motherboard. Most computer components that PCSTATS tests out for you are great for home or office use, but there's a whole other world of computing gear that we rarely touch on; Industrial and POS (Point of Sale) PCs. The essential components of an industrial computer are the same as a regular desktop PC, they're just more likely to come in a miniaturized package. Like you, we're so familiar with desktop computer hardware that its kind of a shock to see an entire motherboard shrunk down to 170 x 170mm, or slightly larger than the footprint of a CDROM. Outside of purely industrial single board computers (SBC), it was VIA that originally delivered the Mini-ITX formfactor in all its 170 x 170mm glory to mainstream computer geeks. The standard is quite a bit smaller than conventional ATX or BTX motherboards, but really the only features lost are expansion slots. With the high level of integration in most of todays graphics-enabled core logics, the loss of a few, or virtually every expansion slot is not that big a loss. Compact sizes also make the Mini-ITX motherboard a really versatile x86 platform. 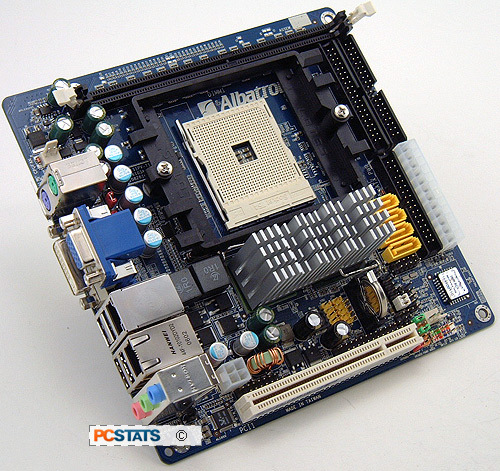 Consider just a handful of potential applications for the Albatron KI51PV-754 motherboard PCSTATS is reviewing for you today. This AMD Athlon64 compatible motherboard could easily replace conventional single purpose devices like a car stereo system, multi camera home security system, or form the backbone of a dedicated network attached storage server, home automation computer, car PC, point of sales terminal or any number of other uses. Where most single board computers are stuck in the Pentium III days, Albatron brings the potential of 64-bit computing into the fold. With a data acquisition card installed into the lone PCI slot, the Albatron KI51PV-754 could form the backbone of a 64-bit industrial, scientific, or lab instrumentation package. A VIA Mini-ITX motherboards by comparison lacks the processing power of the Athlon64 processor, and is not 64-bit compatible either. Albatron takes Mini-ITX into a new direction with its KI51PV-754 motherboard, a high powered 64-bit compatible alternative based on a pair of very capable nVidia chipsets which boast an integrated Geforce 6-series videocard and MPEG-2/WMV9 High Definition video playback support. The KI51PV-754 is built with nVIDIA's GeForce 6150 Northbridge and nForce 430 MCP Southbridge (C51PV and MCP51 respectively), and the tiny motherboard is compatible with Socket 754 AMD Athlon64 processors which support both 32-bit and 64-bit operating systems. The board has one 184-pin memory slot which accomodates up to 1GB of DDR-400/333 RAM. There is just one PCI expansion slot for additional card based devices, so the level of integrated components feeding off of the Geforce 6150's teet is rather high. Off the cuff you'll find both a gigabit and 10/100 Ethernet network jack, a digital DVI video output and a 15-pin analog video output (not to mention an S-video TV-output header), a 5.1 channel audio controller, four 3GB/s Serial ATA II channels which support all the popular RAID modes, a total of eight USB2.0 ports and a collection of other headers that we'll discuss in a moment. The integrated GeForce 6150 videocard even supports HDTV output via an optional cable. At 17 x 17 cm in size, the Albatron KI51PV-754 is quite a bit smaller than a regular desktop or even Micro-ATX motherboard. Even though every square millimeter is occupied, the board is well laid out and surprisingly easy to work with. Given there's a lot going on in such a small space its nice to know tweezers aren't necessary just to connect up a USB header, or the front panel connectors for example. The one small quirk anyone setting up this system will immediately encounter are the two Ultra/133 IDE channels, a keyed 80-wire IDE cables will not work with the standard 40-pin IDE connectors. The Albatron KI51PV-754 has two IDE channels and four Serial ATA II channels available, so there is a lot of room of additional storage devices, optical drives and the like. The IDE channels do not support RAID, but SATA devices can be configured in RAID 0/1/0+1/5/JBOD via nVidia's Mediashield RAID utility. The compact rear I/O panel has a lot crammed in a small space. The motherboard also has a full compliment of serial and parallel ports, and four additional USB ports as motherboard headers. Starting from the left we have a keyboard/mouse PS2 port, a 15-pin analog video output, DVI digital output, a 10/100 and Gigabit Ethernet jack, four USB 2.0 slots and three audio connectors. 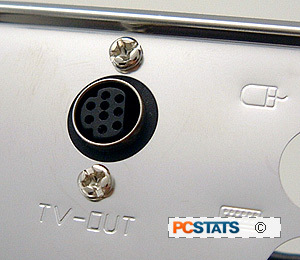 The metal I/O shield contains the TV-out jack which is compatible with S-Video cables. We mentioned that there are a bunch of headers on the Albatron KI51PV-754 motherboard; these are collections of jumper pins for connecting additional brackets to. Normally, we don't go into this level of detail, but given the variety of applications the KI51PV-754 board could be put to task to, we're going to list them all next. Headers include two pairs of USB2.0, one TV-out, one IrDA, one parallel port printer, one SP/DIF, two serial interface (COM), the CPU & chassis 3-pin fan headers, and the Albatron BIOS Security card header. There are no brackets other than the TV-out included with the system board. A 15-pin 'RS232' header is also found just next to the PCI bracket, but there is no further information on it in the documentation. The Albatron KI51PV-754 natively supports ATX 2.0 (24 pin) power supplies, but it's also compatible with the 20 pin ATX 1.4 spec which are more common. Which ever kind of power supply you select, just make sure of one thing above all others... look on the side of the PSU and confirm it delivers at least 20Amp on the 12V line. Probably one of the nicest features of the Albatron KI51PV-754 is that you can use two monitors at the same time since the motherboard sports both an analog and digital DVI video output on the rear I/O. There are a couple of things to be aware of when selecting hardware for a Mini-ITX motherboard like the Albatron KI51PV-754. First you'll need to choose an AMD K8 heatsink which doesn't extend too far beyond the heatsink retention frame, or else you may find it interferes with the DDR memory slot. The reference AMD Athlon64 FX-62 heatsink is too wide to use, as an example. A stock Athlon64 3200+ heatsink, or anything along those lines does just nicely. On the question of computer cases, any standard mid or full-tower desktop case can be used with a Mini-ITX motherboard. Small formfactor toaster sized cases generally have proprietory mounting posts for which ever motherboard they are designed for, so look around for Mini-ITX compatible chassis instead. There are lots out built with PC users in mind, and even more designed primarily for industrial applications. The height of the cooling solution, and whether or not the PCI bracket is used will determine what thickness of case will suit your application - so don't forget to measure first to ensure the mini-ITX chassis will fit. Installation of hardware on the Albatron KI51PV-754 motherboard was smooth enough, but we did experience a problem getting it to boot up at first with the standard memory PCSTATS installs in each test platform. The issue had to do with running the memory at DDR-400, for whatever reason the 'performance' DDR we selected just wouldn't play ball. I'm not sure if the problem lay with the motherboard or processor, but four sets of DDR memory were tested, all with the same result. To fix this issue, the DDR operating frequency was altered to DDR-333, and thereafter the Albatron KI51PV-754 platform operated without incident.